I have always been interested image making and video capture and really like experimenting with different techniques that can be used for altering the perception of time within moving image. I wanted to create a remote controlled time lapse dolly which could be set up to record images for a tracking shot over a long period of time. The shots could then be stitched together to create a tracking timelapse shot. Using items that I had to hand, an iPhone, Lego Technic, an Arduino, motors and servos, I created a rig which would be set to advance across a surface in small timed bursts before then capturing an image. 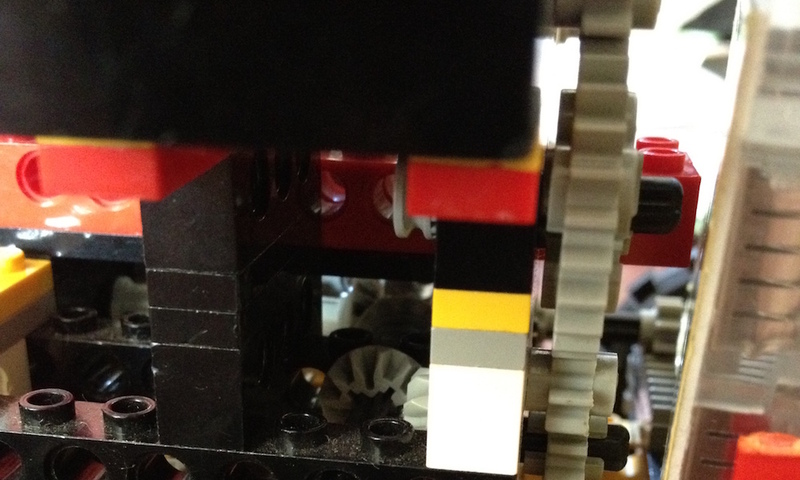 Within the build, I created a stable, wheeled base, with a reduction gearing system to slow the spin of the motor. An Arduino with an H-Bridge circuit then provided me with a method for turning the motor in both directions at a variable speed, providing lots of control over how fast and how far I wanted to move the rig. I also added the ability for the camera to pan and tilt, which I intended to implement at a later date using servos. At the time of creation, there were no time lapse applications, nor was it particularly easy to electronically trigger the iPhone's camera shutter. As such, part of the build was a small button depressing servo which would press the volume increase button on the phone, in order to take the phone at the required time. I go into more detail about this project in this blog post: josephwilkins.wordpress.com/2012/07/18/arduino-powered-time-lapse-dolly, which explains more about some of the processes and techniques involved.